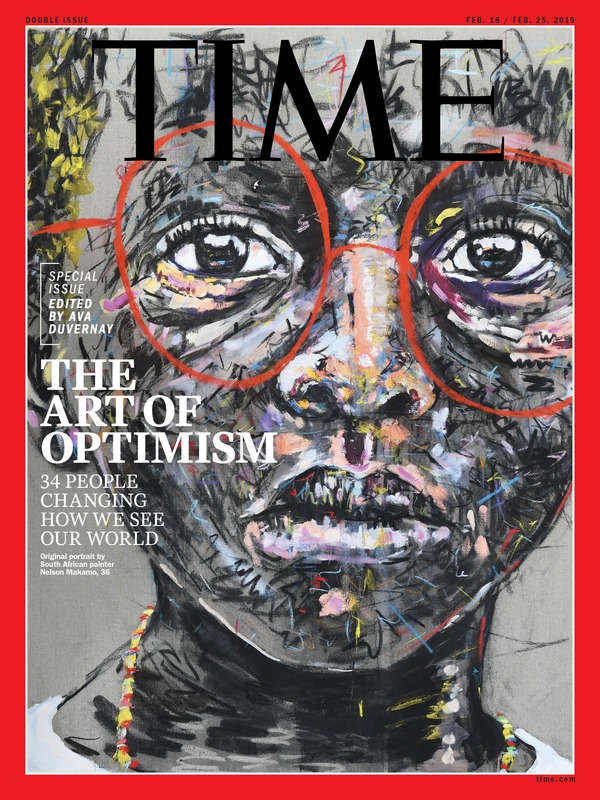 The latest painting that Mapule has inspired is Makamo’s cover for TIME’s 2019 Optimists issue, guest edited by filmmaker Ava DuVernay. Optimism is a natural fit for Makamo’s work, which has for several years largely focused on young children from rural South Africa. “Later on in life we sometimes forget there’s beauty in being a human being,” he says, speaking from his home in Johannesburg. “But children are just discovering that. These days Makamo finds hope in contemporary African artists, including fellow South Africans Kemang Wa Lehulere, Sam Nhlengethwa, Dineo Bopapeand Zwelethu Machepha, and Nigerian visual artist Toyin Ojih Odutole. He’s also a “big fan” of American painter Kerry James Marshall – whose works exploring black history and identity in the U.S. have reportedly made him the highest paid living black artist in the world.